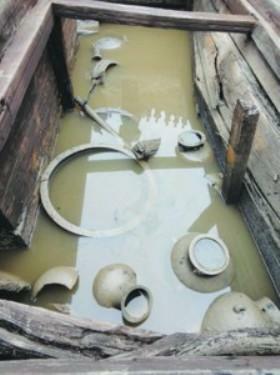 Two large-scaled tombs were recently discovered at a construction site in Lu'an city of East China's Anhui Province. It is regarded as the biggest archaeological find in the province since 2009. The two tombs are oriented east and west and lie abreast, 20 meters away from each other. The local archaeological team started the excavation on the north tomb, which is apparently smaller, from April 1st and has successfully opened the chamber. There are three layers of coffins in the chamber, which is very rare in past finds, and the whole structure is solid and intact. Archaeologists estimate that the two tombs belong to the Kingdom Chu of the Warring States Period. Fortunately, the tombs appear not to have been damaged over the past 2200 years. Wang Xin, Captain of Lu'an Archaeological Team, said, "From the funeral chamber arrangement and the excavated relics, we assume that the tombs were from the mid years of the Warring States. 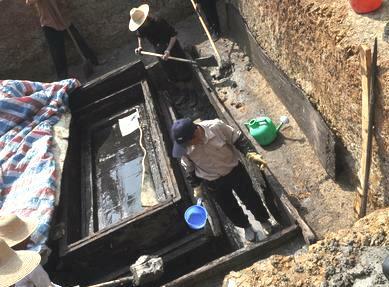 During that period coffins were usually covered by chambers and they were buried deeper than those from the Han Dynasty." More than 1100 bronze vessels, ceramic worship objects, and porcelain have been discovered in the smaller tomb. Archaeologists presume it belonged to a woman. They also excavated an exquisite and intact bronze mirror. With the diameter of 27 centimeters, the mirror's back was inscribed with six hieroglyphic characters of "mountain" and intricate patterns. According to Kong Xiangxing, a local bronze vessel expert, mirrors with "mountain" hieroglyphic characters are commonly seen in remains of Kingdom Chu. However, this mirror is the biggest and with most characters even found. Experts predict that more relics will be excavated from the south tomb. Currently, archaeologists are cleaning the tomb's chamber. After all the funeral items have been taken out of the ground, the two coffins will be removed to a more appropriate location for opening. 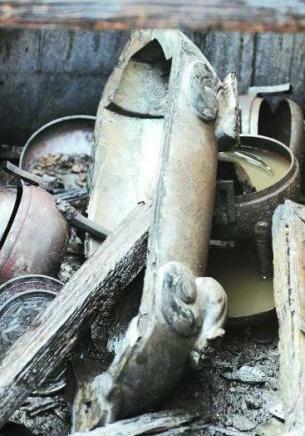 Dozens of cultural relics were discovered in the southern tomb, one of the two adjoining tombs dating back to the period of China's Warring States(475-221BC), Monday in Lu'an city, Anhui province. Some of them are much bigger than those found in the northern tomb. The tomb remains intact except for a hole above the outer coffin suspected of being dug by tomb robbers. Luckily, the hole is not deep enough to reach the coffin. The archaeologists working at the site explained that the robbers might give up as the coffin was as deep as approximately 20 meters. The outer coffin is still regular and complete even after 2,000 years. It is 5.6 meters long and 3.46 meters wide, larger than the one in the northern tomb. The mortise and tenon joint was used for the coffin. Many cultural relics were unearthed, including bronze tripods, which symbolize the lordship of the tomb occupant. According to the excavated possessions, the southern tomb may belong to a male while the northern one is likely to be occupied by a female, Li Dewen, professor of Anhui Provincial Cultural Relics and Archaeology Institute said.